No harmful chemicals - this HEVEA Kawan natural rubber duck bath toy and the Kawan natural rubber teether are the perfect gift idea for the new baby in your life. This adorable combo encourages baby's sensation of touch and stimulates the development of baby's vision. Unlike the traditional bath toys and teethers on the market It's unique, one-piece design eliminates holes and cracks and prevents the build-up of harmful bacteria. Made from 100% natural rubber, a safe solution for tiny babies and tots. Hevea bathing toys are soft and malleable, yet durable. 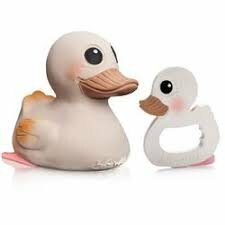 The duck toy's patterned texture on beack and feet is ideal for soothing and massaging irritating gums.